A healthy body and glowing skin is what everyone desires to have. 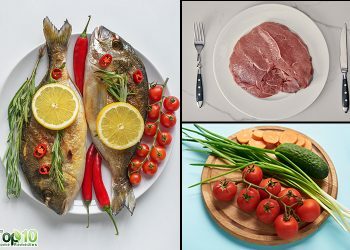 A well-balanced diet can make a huge difference, and people are increasingly making the necessary efforts to eat healthy. This is one reason why people are giving up carbonated drinks that have adverse side effects and looking for healthier options that can be made at home with readily available ingredients. One such health drink is fresh ginger carrot juice. It will help you boost your fruit and vegetable intake and provide many health benefits. These two vegetables have a rich variety of nutrients, including multivitamins, minerals, and antioxidants. 1. Peel the carrots, then rinse them in running water and dry them. 2. Remove the skin of the ginger root and rinse it thoroughly. 4. 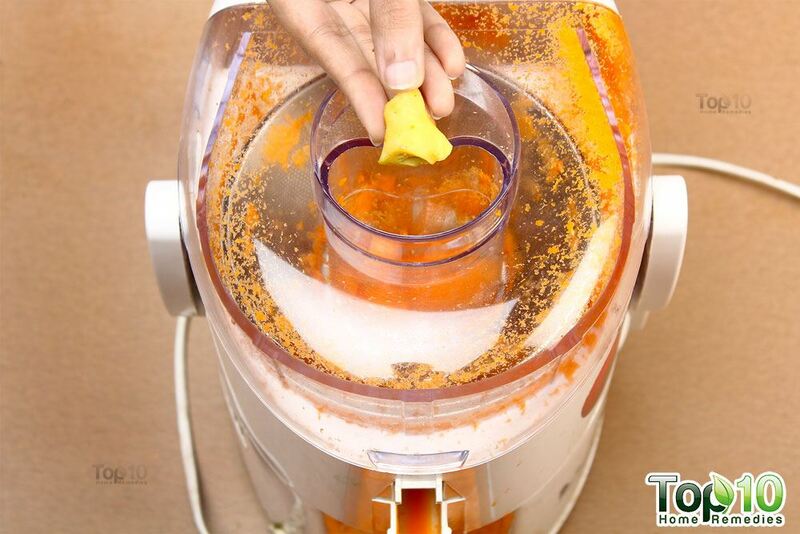 Put the ginger root piece through the juicer. 5. 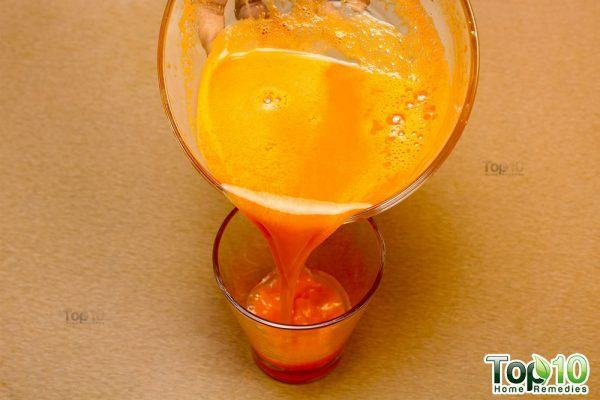 Transfer the juice into a glass. 7. Add a pinch of sea salt or cinnamon powder for added flavor if you like. Drink it once daily, preferably with your breakfast. 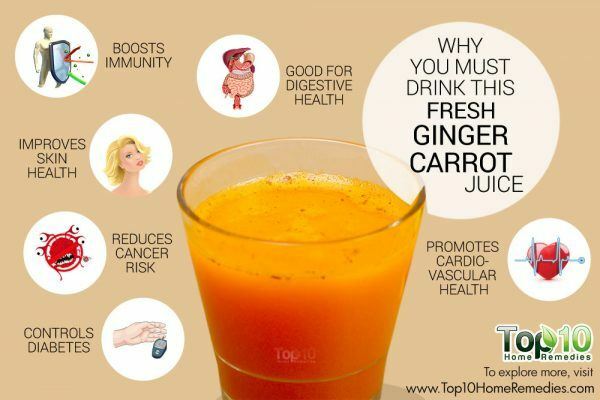 Here is why you must drink fresh ginger carrot juice. 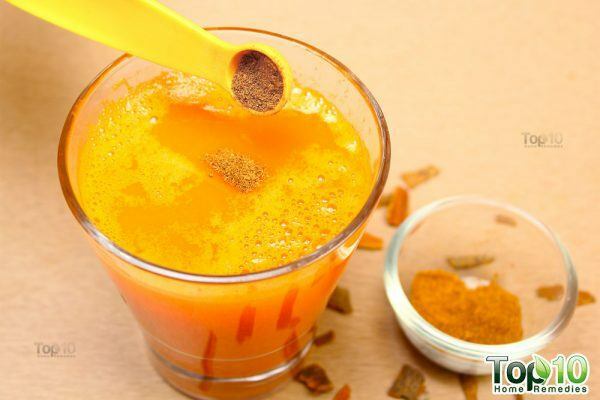 This healthy juice is also good for your immunity and the elderly people as well as growing children can benefit from it. The vitamins A and C in carrots aid in the production of immune cells. In particular, vitamin A improves production of white blood cells, which help get rid of pathogens that pave way for illnesses. A 2003 study published in the Annals of Nutrition & Metabolism says that supplementation of a low-carotenoid diet with tomato or carrot juice modulates immune functions in healthy men. 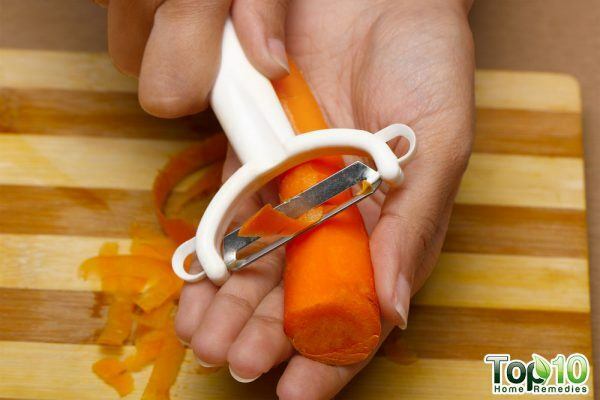 When it comes to carrots, opt for organic varieties to boost immunity. A 2012 study published in the Journal of the Science of Food and Agriculture reports greater stimulation of immune response after consumption of organic carrots as compared to other types. Ginger boosts the immune system because it contains strong antioxidant and anti-inflammatory properties. Plus, it improves circulation, meaning more oxygen is reaching your tissues to help remove toxins. A buildup of toxins can weaken your immune system. A 2006 study published in the Journal of Ethnopharmacology suggests that the volatile oil of ginger influences both cell-mediated immune response and nonspecific proliferation of T lymphocytes. This prevents chronic inflammation and autoimmune diseases. A 2008 study published in BMC Complementary and Alternative Medicine reports that ginger extract inhibits macrophage activation and APC function and indirectly inhibits T-cell activation. T-cells are an important part of the immune system. There are several nutrients in ginger carrot juice that promote healthy skin and keep skin problems at bay. Being rich in vitamin A and various other antioxidants, carrots are good for the skin. They keep the skin moisturized and prevent acne, pigmentation, blemishes and uneven skin tone. 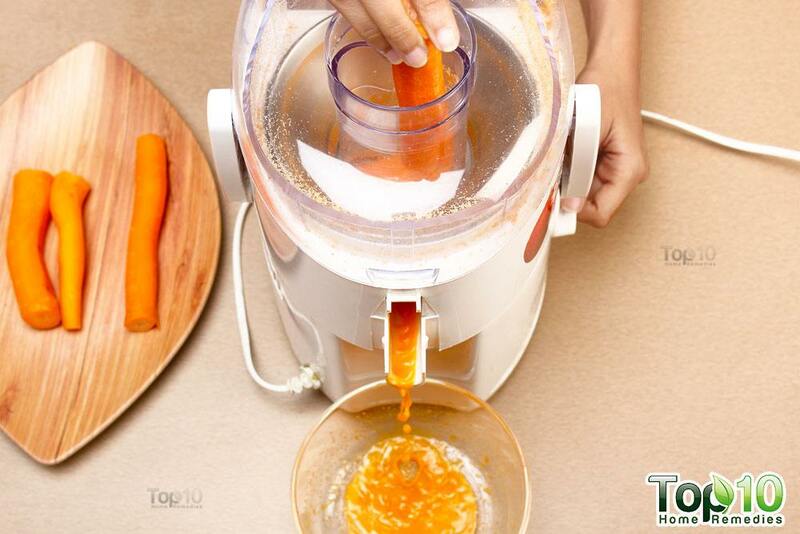 Carrots are a good example of root vegetables containing beta-carotene, which promotes healthy skin. 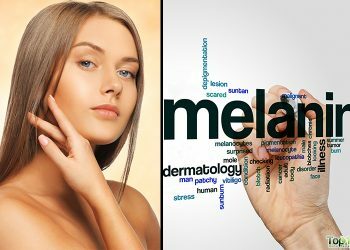 A 2012 study published in the American Journal of Clinical Nutrition reports that beta-carotene and other carotenoids help protect the skin from damaging ultraviolet sunlight. 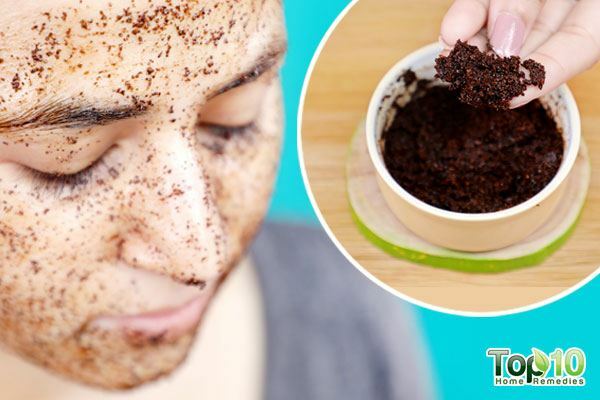 They also contribute to maintenance of skin health and appearance. Ginger, also rich in antioxidants, vitamins and minerals, further promotes smooth and clear skin. A 2012 study published in the International Journal of Molecular Science reports that the antioxidants in ginger help in skin cell proliferation and repairing skin damage. 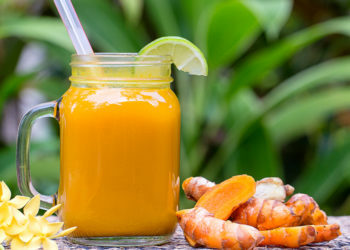 Fresh ginger carrot juice offers all-natural cancer protection due to its anticancer, anti-inflammatory, antioxidant, anti-proliferative and anti-metastatic properties. Ginger can combat different types of cancers, such as ovarian, colorectal, lung, breast, skin, prostate and pancreatic. Ginger inhibited the proliferation of breast cancer cells, without significantly impacting the viability of non-tumor breast cells, according to a 2012 study published in the Journal of Biomedicine & Biotechnology. 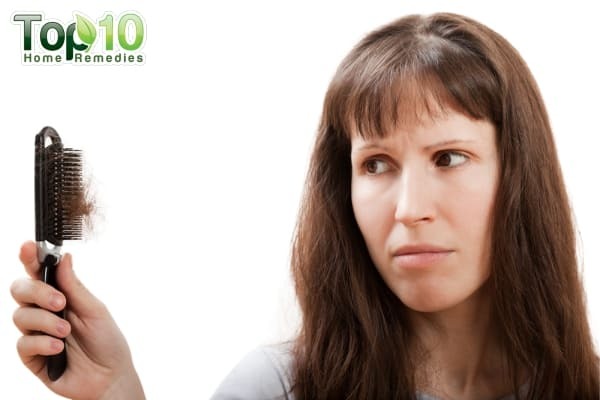 It recommends ginger for the treatment of breast carcinomas. Another study published in the British Journal of Nutrition in 2012 showed that whole ginger extract helped shrink prostate tumor size by as much as 56 percent in mice. 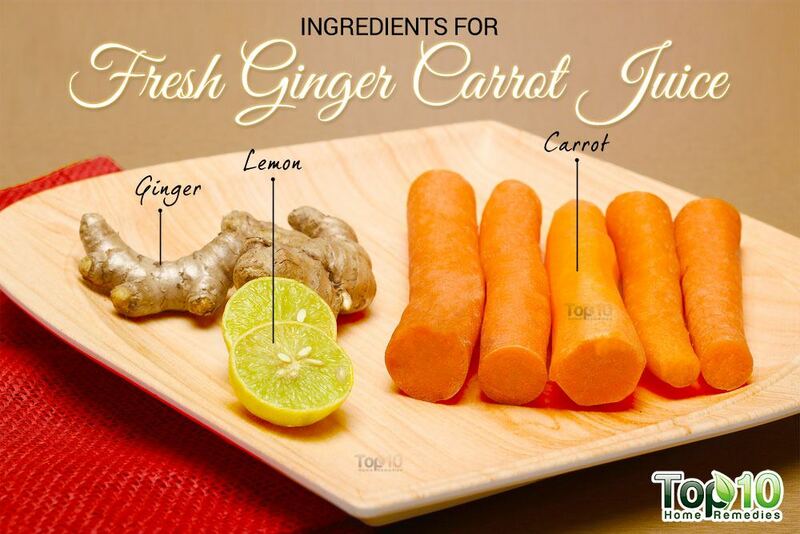 Just like ginger, regular intake of carrots can lower the risk of lung, colorectal and prostate cancers. They contain phytonutrients called polyacetylenes and other components that inhibit cancer. A 2015 study published in the European Journal of Nutrition states that regular carrot intake might be inversely associated with prostate cancer risk. Both ginger and carrots are known for their antioxidant and cleansing properties, which positively contribute to cardiovascular health. Carrots are extremely good for your heart health. The antioxidants – beta-carotene, alpha-carotene and lutein– in carrots help fight cholesterol and reduce the risk of a heart attack. The potassium in them is good for lowering high blood pressure. A 2011 study published in the Nutritional Journal reports that regular intake of carrot juice increases total antioxidant status and decreases lipid peroxidation in adults. This is good for cardiovascular health. Ginger is also good for your heart, as it helps lower cholesterol levels, regulate blood pressure and prevent blood from clotting. All these factors are important elements of heart health. A study published in Planta Medica in 2013 reports that the gingerol in ginger helps in regulating blood pressure and strengthening the heart. Another 2015 study published in Molecular Nutrition & Foods Research confirms that ginger and its constituents play a key role in improving cardiovascular health. People who have diabetes, as well as those who are at a higher risk of developing diabetes, should include this antioxidant-rich ginger carrot juice in their diet. Ginger helps lower your blood sugar level and even increases the effectiveness of insulin and other drugs used for treating diabetes. It also helps prevent health complications associated with diabetes and uncontrolled blood sugar. A 2015 study published in the Iranian Journal of Pharmaceutical Research showed that ginger supplementation significantly reduced the levels of fasting blood sugar, hemoglobin A1c, Apolipoprotein B, Apolipoprotein A-I and Malondialdehyde in Type 2 diabetic patients. This study even recommends ginger as a good remedy for diabetic patients to diminish the risk of some secondary chronic complications. Along with ginger, carrots are also good for diabetic people. They have a very low glycemic load and the carotenoids in them help regulate blood sugar. Plus, the high vitamin A content in carrots helps protect your eyes from diabetic retinopathy or damage to the eyes’ blood vessels from long-term diabetes. 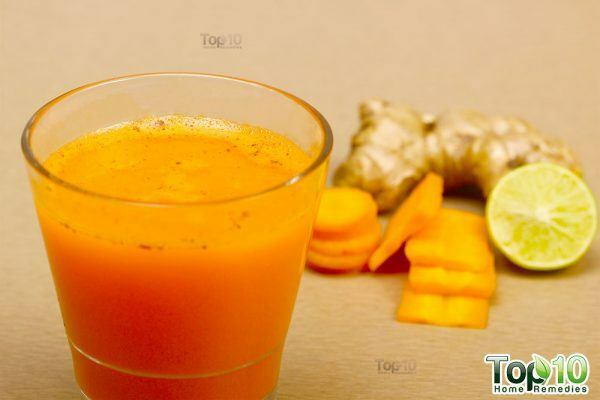 If you often deal with digestive problems, you should include this tasty ginger carrot juice in your diet. Both ingredients are rich in nutrients that are good for the digestive system as well as the colon. 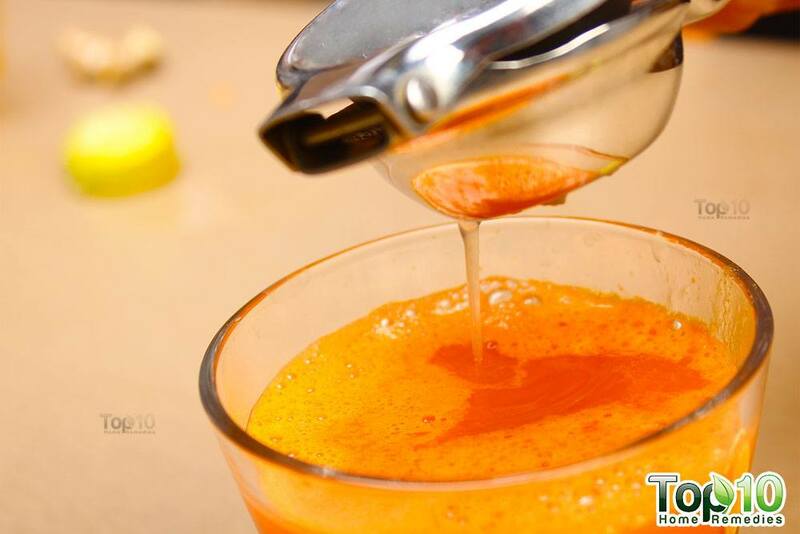 Raw carrot juice works on the mucus membranes of the stomach and colon and helps treat constipation. Ginger helps stimulate the emptying of your stomach. It reduces nausea, pain and inflammation, and provides relief from heartburn. Also, the carminative nature of ginger can calm an upset stomach. It can even relax the gastrointestinal muscles, hence preventing gas and bloating. As this healthy juice will start losing its nutritional value due to oxidation, it is important to drink it immediately after preparation to enjoy its full benefit. If you want, you can add 1 green apple or 2 celery stalks to the recipe. Herbs like mint, sweet basil and parsley also go well in this juice recipe. If you have a sweet tooth, you can add a spoonful of raw honey. Depending upon the type of carrots you use, the taste may vary. this seems to be a very good suggestion. will try it for a month and see the difference ,if any. 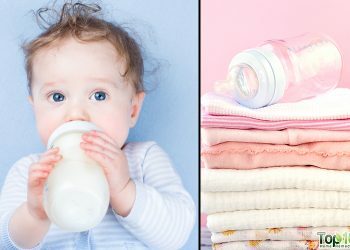 excellent and easy ways for applying such good tips. thanks for all these.